With a reputation for reliability, strength, durability and quality, the conventional single-acting ram-type steering gear can be delivered in a hand-hydraulic version for smaller vessels and in only hydraulic (PTO) an (electro-)hydraulic versions for larger ships. For vessels with a reduced-space steering gear compartment, we can provide a compact steering gear type with built-on power units and an incorporated upper-rudder carrier bearing. All steering gear can be delivered with a number of options - electric starters, control, alarm and monitoring systems, upper-rudder carrier bearing and electric rudder-angle indicator systems. Rudder torques up to 2500 kNm and rudder angles of 2x45° are achievable by this Steering Gear type. Single and multiple rudder steering gear arrangements are available. During the last decades, Brusselle developed Steering Gear with double-acting cylinders. These Steering Gear are more compact and cylinders are fully redundant. These steering gear can be delivered in both only hydraulic (PTO) and (electro-)hydraulic versions. Single and twin rudder types are available. Rudder torques up to 800 kNm and rudder angles up to 2x65° are achievable by this Steering Gear type. Single and double rudder steering gear arrangements are available. 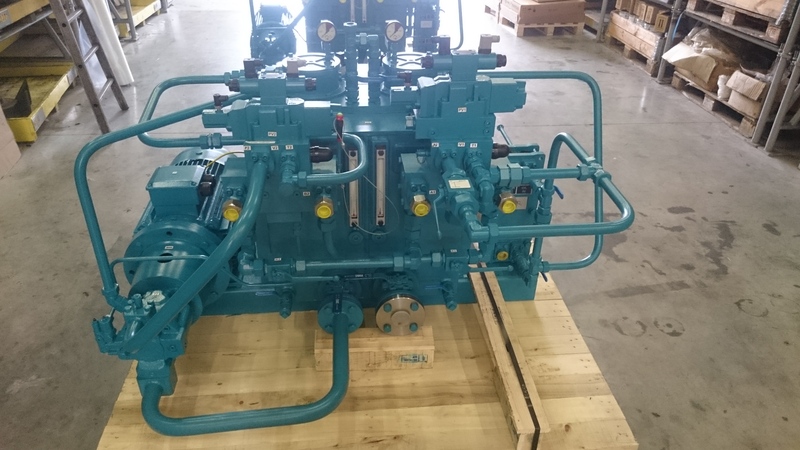 Hydraulic Power Units for any Brusselle Steering Gear are custom built, according to applicable class requirements (BV, LROS, DNV, GL, CCS...). Where electric driven pumps are installed, electric switchboards can be delivered, where start/stop commando's and applicable alarms are processed.